Biography is being introduced around the third grade with the new mandate to integrate more non-fiction into the K-12 curriculum. Who are appropriate role models for twenty-first century children? List of names on teachers’ blogs and site with downloadable instructional content are still dominated by presidents, explorers, inventors, scientists, and activists, but those lists are somewhat more diverse than they were a generation ago. In recent displays of storyographies at Princeton’s independent bookseller, I’ve seen more about notable women in general, which is encouraging. Some of the new subjects are famous writers and that raises some conundrums. Let’s suppose more children than before (at least in elite families) have been “introduced” to classic literary works via Cozy Corner board books, but will that trend significantly increase the number of eight-year-olds eager to learn more about authors they won’t encounter until high school or university? Will any author’s life, much of it spent hunched over sheets of paper, a typewriter, or computer, sound very exciting to third-graders? Author Jonah Winter and illustrator Calef Brown put their money on Gertrude Stein, the mother of the twentieth-century avant garde and lesbian icon when they created a storyography about her in 2009. The small type on the trim of the writer’s jacket promises young readers that they will find the large woman in purple fascinating because “Gertrude is Gertrude Stein, a most fabulous writer, who lived a most fabulous life.” The cover design’s style hints that this book won’t be a dutiful chronological trot through a great writer’s career. In fact the only hard facts are confined to the one-paragraph “Who was Who” on the final page. Here the key to Stein’s “whimsical world” is her famous sentence “A rose is a rose is a rose is a rose,” which was first used in her poem “Sacred Emily (1913). Winter riffs on it for thirty-two pages to conjure up the most famous part of her life as an American expatriate in Paris living at 27 rue de Fleurus, where artists and writers flocked to her Saturday night atelier. These were no ordinary parties “heavens no.” Why did anyone who was someone in the Parisian art world want an entree to Gertrude’s apartment? “Oh look.“ No wonder so many people thundered up the stairs to mill in the crowd paying their respects to this hostess with the mostest. Who cared if Picasso was choleric? “He just invented Modern Art, which is not the same thing as being angry but then again maybe it is. Maybe it is and maybe it isn’t. Then again maybe it is. It’s so hard to invent modern art.” Quibble one… Brown’s takes on some of Picasso’s most famous works aren’t identified, so it’s tough on the grown-up reader doesn’t recognize them and has to hurry past them to the next page on Matisse. Quibble two. 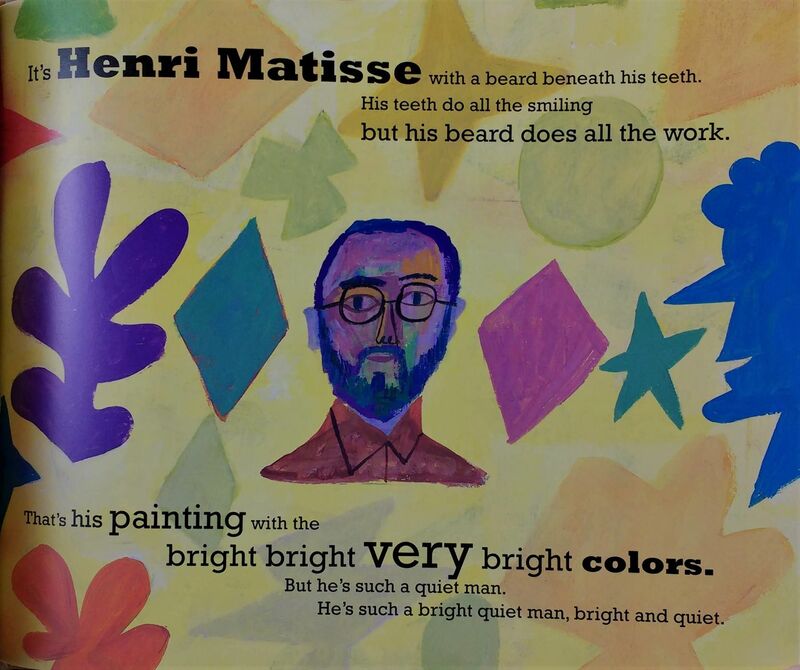 Gertrude’s guests would have associated Matisse with big colorful paintings not paper cuts–those were the works he made at the end of his career after Gertrude Stein had died of stomach cancer. Obviously Winter’s goal was to demystify modern art so any kid who reads this storyography will grow up receptive to instead of prejudiced against non-representational art. Veering towards the truthy is always a risk when simplifying complex ideas for elementary-school students, but the author’s strategy of imitating Stein’s famous ” x is x is x is x is” makes any explanation nonsensical. They may get a laugh when read aloud, but it’s fair to ask if they won’t give children rather peculiar and unclear ideas about modernism that may stick in their heads for years (shades of John Locke). So readers never learn that “Queen Gertrude” was a patron of her artist-friends (she and her brother were ahead of the market) and her apartment was hung floor to ceiling with their works. In The Autobiography of Alice B. Toklas there is a hilarious story about the dinner party where Gertrude hung a work by every artist opposite of his place at the table that is completely in keeping with Winter’s tone, but this is what is said about Stein the prescient collector of contemporary art. The text continues, “Those crazy pictures sure are crazy. Who cares? A picture is a picture. It can be whatever it wants to be. It doesn’t have to make sense. It doesn’t have to look like a waterfall, not if it doesn’t want to. A picture can be whatever. Why of course it can.” And when Gertrude writes at night after all the company goes home, she does whatever… Modernism boils down to having fun not making sense? There’s no meaning whatever? Pity poor Alice B. Toklas Gertrude’s amanuensis deciphering sentences (oops, I mean having fun) the morning after a nocturnal writing spree. This entry was posted in 21st century, American children's books, English Language Children's Books and tagged Alice B. Toklas, American women writers, Calef Brown, Gertrude is Gertrude is Gertrude is Gertrude, Gertrude Stein, Jonah Winter, Modernism, Picture book biographies, Women writers by Andrea Immel. Bookmark the permalink.